This volume focuses on the theory and practice of the regenerative development paradigm, which is rapidly displacing sustainability as the most fertile ground for climate change adaptation research. This book brings together key thinkers in this field to develop a meaningful synthesis between the existing practice of regenerative development and the input of scholars in the social sciences. It begins by providing an expert introduction to the history, principles and practices of regenerative development, before going on to present a thorough theoretical examination by known theorists from disciplines including sociology, geography and ethics. A section on regenerative development practices illustrates the need to significantly advance our understanding of how urbanization, climate change and inequality interact at every scale of development work. Finally, the book ends with a serious consideration of the ways in which integrated systems thinking in higher education could result in a curriculum for the next generation of regenerative development professionals. 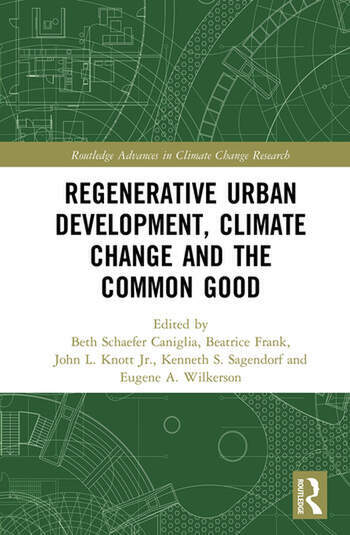 Regenerative Urban Development, Climate Change and the Common Good will be of great interest to students, scholars and practitioners of regenerative development, climate change, urban planning and public policy. John L. Knott Jr is the creator of the CityCraft(R) process and Founder of CityCraft(R) Ventures, which restores the economic, environmental and social health of cities.